Merry Christmas everyone! I hope you all had lovely days with your family and friends wherever you are in the world! We had spent our Christmas Eve in a way I never have before… sunbathing! I had baked jam tarts and shortbread in the morning and we went to get all our alcohol for the next day in the evening but it was a very hot day so there wasn’t anything that was more ideal than sunbathing the day away. 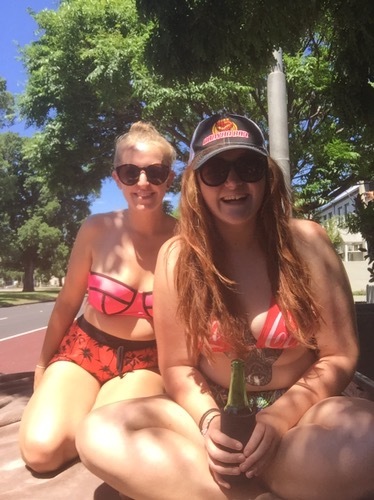 Our garden is very overgrown and has a lot of spiders in it so we didn’t fancy sunbathing out there so instead we put a blanket on Kathryn’s Ute (a truck) and sunbathed outside the front of our house. I can’t say I felt very Christmassy but we did watch Christmas films and TV that night, including the Gavin and Stacey Christmas Special which was just great and we were still up when it hit midnight and officially the start of our Christmas! Despite not feeling super Christmassy, my Christmas Day was brilliant!!! We had a Christmas breakfast with bucks fizz, watched Christmas movies (Muppet Christmas Carol YES) and had a Christmas dinner. The best bit though was going to the beach at St Kilda. We finished Christmas dinner around 4ish and went for the tram (it’s free on Christmas Day). It was super hot reaching around 37/38 degrees which was pretty intense heat, probably the hottest we’ve experienced in Aus! We had loads of drinks sorted in plastic bottles (no glass is allowed on the beach) and there were a surprising number of other people getting the tram down to the beach as well – I don’t think I had realised how popular it was to do here. We were all surprised by the number of people on the beach when we arrived. The water, beach and grass foreshore above from the sand were all full of people! Kathryn’s friends from when she lived in Thailand were there so we met up with them and then got our drinks sorted before going into the sea. The last time we had gone in the sea in Aus (when we had been on Philip Island – post still to come) it had been freezing but because it was such a hot day, being in the water was great! So many people were out in the water and occasionally a massive cheer would just erupt up the beach as everyone celebrated Christmas. We were on the beach for the sunset too which was just beautiful. It was amazing being around so many happy people all celebrating together and definitely made it so you weren’t sad to be away from home. I don’t know if it felt like it was Christmas Day but it definitely felt like a big occasion so was super fun! Even after it got dark the party continued (except the water was pretty cold now so we stayed on the beach). We stayed until around 10ish and then got the tram home to FaceTime our families and eat a bit more food. It was my first Christmas away from home and I had been kind of dreading it but it was a truly fantastic day and I am so glad I got to experience it and spent it with such lovely people – thank you Niall, Kathryn and Laura for making it so good! On Boxing Day, Niall and I had tickets to go to the Boxing Day test match a the MCG which is a tradition for many people in Melbourne. The match was between Australia and Pakistan and was the first day of a five day test match at the ground. We had also got tickets for my friend from uni, Becky and her friend Kathryn and they met us a couple of hours into the match. It was another good game with so many people dressed up. There were around 63 thousand people there and I really like how the crowds are so mixed between the two sides. The cameramen found a large group of Aussie supporters and a large group of Pakistan supporters and they were kind of competing to be the loudest chanters. It was a lovely day but unfortunately (and in true Melbourne weather style) the play for the day was called off at around 4ish because of the rain – you wouldn’t have believed it had been so hot the day before! All in all, it was a really good Christmas and not one I’m going to forget!